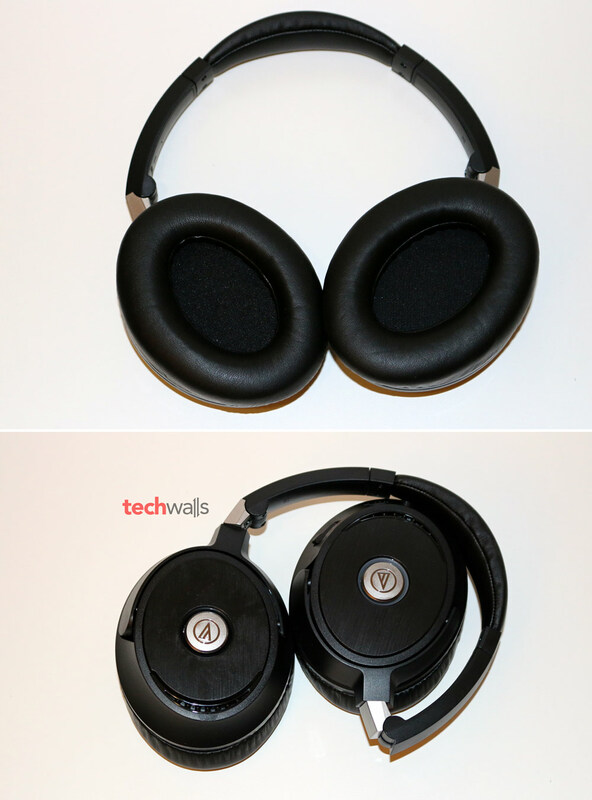 Audio Technica ATH-ANC70 QuietPoint Headphones Review - How does my first Noise-Cancelling Headphones Perform? 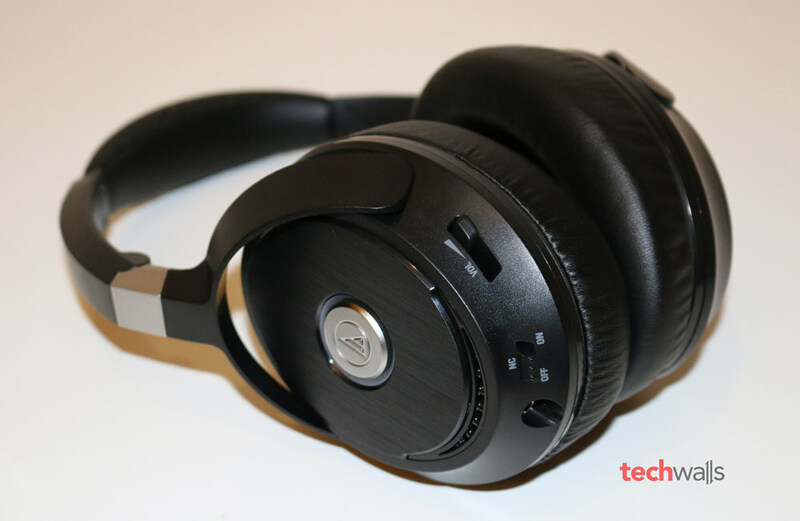 Audio Technica ATH-ANC70 QuietPoint Headphones Review – How does my first Noise-Cancelling Headphones Perform? 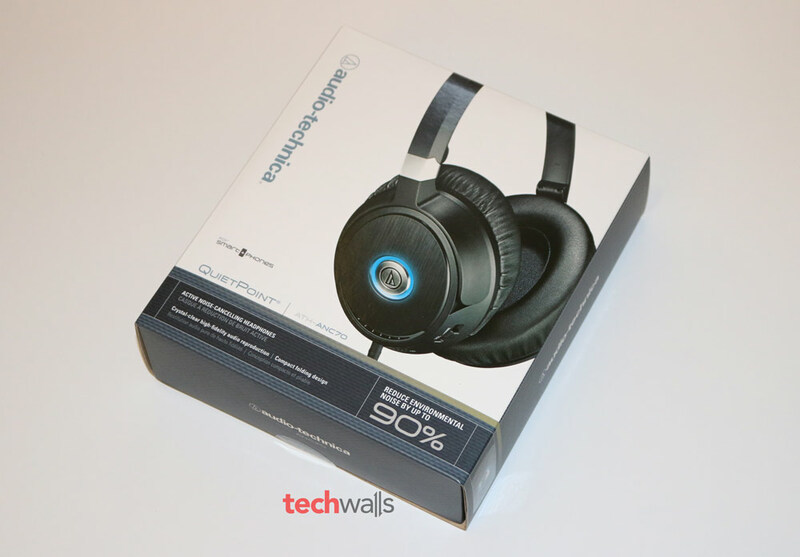 Before you read this post, I need to disclose that I never used noise-cancelling headphones before I received the Audio Technica ATH-ANC70 QuietPoint Headphones for this review. Noise-cancelling headphones have an obvious advantage in blocking external sounds, so they are very suitable for traveling, studying or anytime you need a quiet environment. However, the reasons I was not interested are because the noise-cancelling headphones are priced higher and sound quality is often compromised. Can the Audio Technica ATH-ANC70 deal with those issues? Keep reading my review. 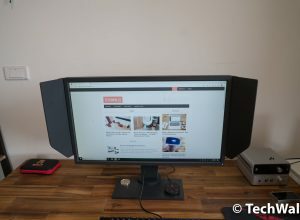 I was in love with the ATH-ANC70 immediately when I unboxed the item. 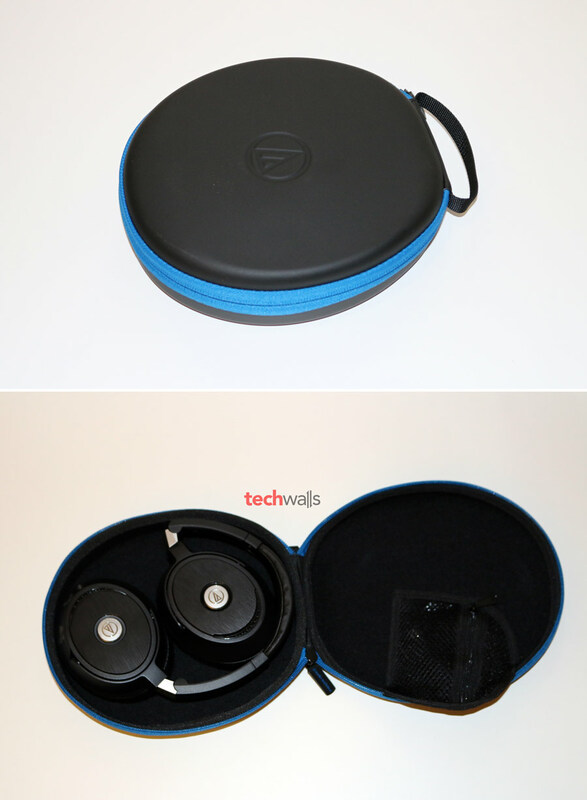 The headphones stay inside a nifty carrying case along with some accessories including an audio cable, a 6.3 mm stereo adapter, an airline adapter, and an AAA battery. The case is slim, tough and finished with a soft-touch coating. I like the case because it can keep the headphones and accessories pretty well without taking too much space. The carrying case neatly keeps everything inside. I also like the design of the headphone unit. It can be folded up and fold flat, that’s the reason why it can stay comfortably inside the compact case. The two earcups are padded with a thick layer of memory foam that are covered in pleather. The top of headband is also padded with a slim stripe of memory foam. The padding is great but I don’t feel very comfortable wearing the headphones over a long period of time. After about 1 hour, my ears start sweating and I feel some pressure on top of my head although the headphones are quite lightweight. It is because the earcups are too tight for my ears and the headband’s width is quite narrow, so the pressure can’t be spread over a large area. 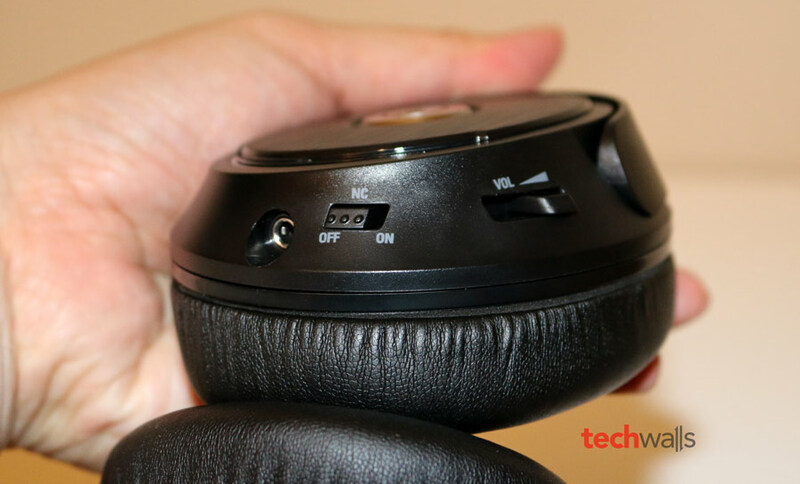 To enable the active noise-cancelling feature, you will need to insert an AAA battery to the right earcup. Just slide out the cover on this earcup and you will see the compartment. The battery could last up to 40 hours but I still hate replacing batteries all the time and you should remember to turn it off after each usage because the battery could drain out pretty fast. All controls are put on the left earcup, here you can plug in the audio cable, adjust volume and turn on/off noise-cancelling. Besides, there is a hidden button underneath the logo on the earcup, you can press once to play/pause/answer phone calls, press twice to move to next track or press 3 times to move to previous track. I was excited to try noise-cancelling feature on the Audio Technica ATH-ANC70 because I travel and commute in loud environments, especially in subways. A recent research showed that subway noises can damage our ears and I really don’t want it to happen. Audio Technica claimed that the headphones can reduce environmental noise by up to 90%, so I want to test if it is true. After comparing before and after turning on the noise-cancelling feature, I could see a significant difference. Absolutely, it can’t get rid of all outside noises but it is much quieter and I can listen to music without cranking up the volume. This is really a good way to protect your hearing if you are riding subways daily. It is difficult to get an exact number but I guess the noises can be reduced by 50-60%. In the loud environments, it is recommended to turn on the noise-cancelling feature because you will be able to hear much clearer and cleaner sounds. However, when I stay at home and make the comparison, turning it off actually can deliver a better sound and it also doesn’t consume any power. In the passive mode, the sound is much brighter but not excellent yet. The bass sound is quite weak compared to most of my headphones, the midrange is accurate and clear, and the treble sound is not so bright and open. 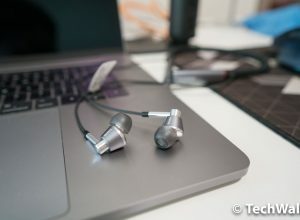 The soundstage of the headphones performs very poor, so it makes the music experience very dry and not enjoyable. Compact design with great build quality. Some useful accessories are included. Convenient controls on the headphone. No rechargeable battery, so you will have to replace the AAA battery very often. The sound quality is not impressive. The Audio Technica ATH-ANC70 QuietPoint Headphones are on sale on Amazon for $199. 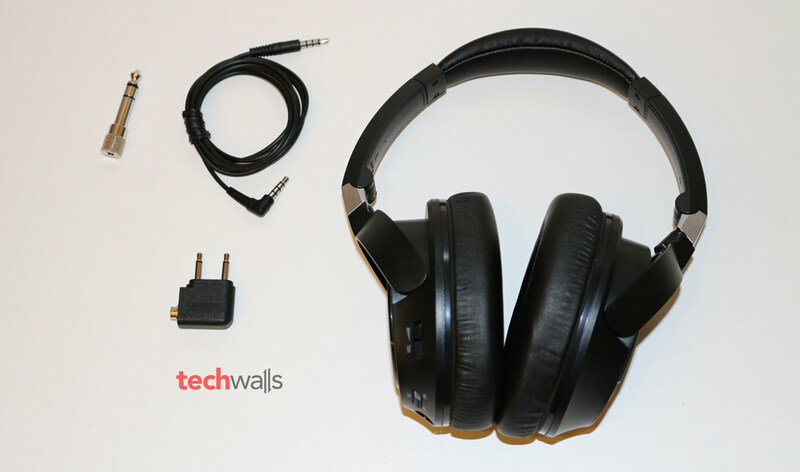 Although its primary feature performs pretty well, there are still some limitations existing on the headphones. The sound is not brilliant but it still can meet the needs of travelers and commuters. I will easily recommend this product if its price tag decreases to around $100. 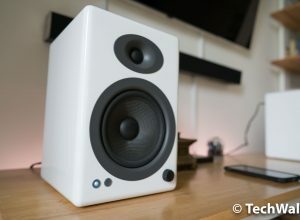 If you decide to buy something from Audio Technica – think twice! There guaranty is nothing. Spent your money somewhere else, there is a big competition and its easy to find an alternative. Removing the battery cover is hard if not impossible. 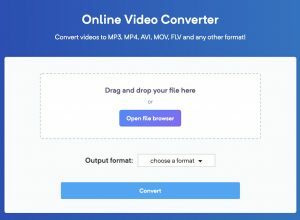 Any advice and I’ll stop complaining.